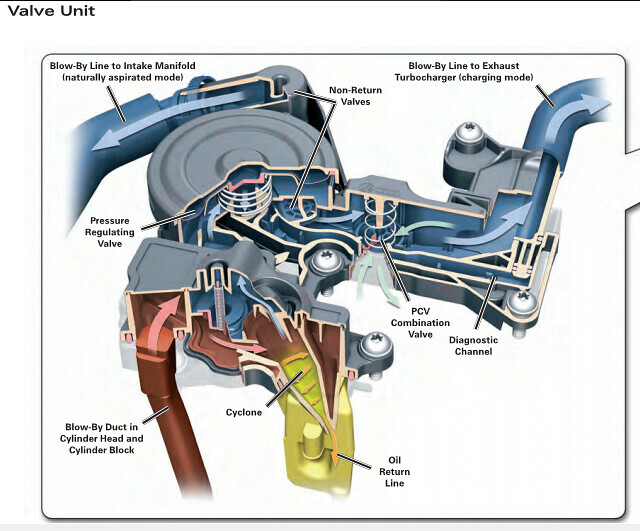 Basic-there are 2 paths for pcv 1 when under vac condition you are using the intake path, 2 when under boost you are using the rear pcv as turbo spools it creats a suction on rear hose. there is a couple of checks in the pcv unit when they go bad or leak they allow boost pressure to flow from intake to crankcase. can you say rear main leak. You can start your car without the MAF sensor plugged in (and drive if you want) and if the idle surge goes away you may want to clean or replace your MAF. If you unplug the MAF and start or drive the car you will want to clear any error from the unplugged MAF. I'll try unplugging my MAF today. I did already pull and clean it, however it very well could be on its way out. 7-10 days still seems excessive, but I'm no expert. Consider this... With the intake hose in place, I haven't collected an inch of fluid in a couple thousand miles, but the catch can is still functioning under boost when it is suppose to be needed the most. Maybe someone with a catch can other than the ECS system can chime in, but when I was looking into the apr setup I believe it said you needed to drain the can yearly. I don't understand where this huge difference in fluid collection is coming from. In my experience with my can, most of it is water but there was also enough oil in there too notice a drop in oil level over a longer period of time. Edit: I disconnected my MAF and my car was ok for a couple hours before it began idle surging again. Last edited by kglewis1; 10-20-2018 at 05:40 PM. Just did a track day today with the ecs tuning catch can with the front pcv hose attached. Cleaned out the catch can right before I left for the event. After coming home and checking it it's literally bone dry just how I left it after I cleaned it in the morning. 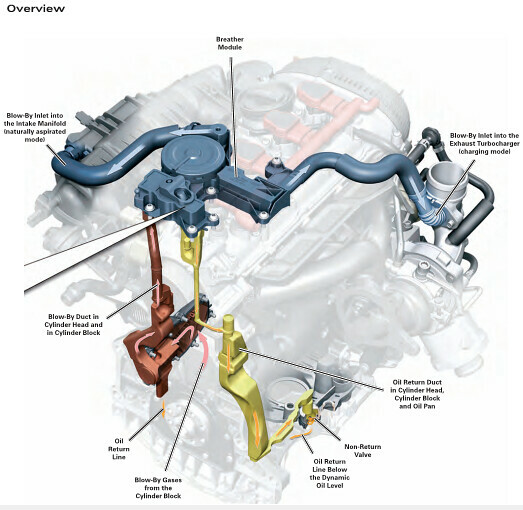 The ECS only catches oil by help of rear vacuum from turbo inlet (during boost mode) while eliminates front vacuum from intake manifold during N/A mode (idle). Last edited by mraaf; 10-21-2018 at 10:24 PM. So if this is true, and the ECS can is catching oil in boost, why does reconnecting the intake to the PCV, which only changes operation at idle, so greatly reduce fluid being caught in the can? I don't seem to be catching anything anymore, yet my can is still 100% operational under boost. Perhaps it has nothing to do with re-connecting front vacuum. It is more to your driving condition. I haven't catch anything while daily driving but would catch about 200-300ml of pure engine oil when hitting 4 hours session track days. If I were catching oil during daily drive, I would be worry about excessive blowby. I have same setup as ECS but with front PCV connected. I just did a track day yesterday and my catch can was spotless after. I'd typically have to empty it as soon as I get home (or during the event depending) if I left that front hose blocked off. Blocking off the front hose must increase the suction of the rear pcv which causes the can to fill so quickly. Last edited by zef; 10-22-2018 at 10:46 AM. My other concern on PCV gas which is re-route back into engine is heat its carries, which I think might reduce efficiency of the intercooler. Thinking of having a small gas cooler (with a drain valve) after the catch can. I believe it actually causes positive pressure in the crankcase during N/A or idle which is causing oil/fluid to be pushed into the can. This is my experience anyway. With the ports blocked off, I had pressure under my oil cap which caused oil splatter to blow out if the cap was removed. My understanding is that this is normal for this setup. My concern here is how much of this blowby is getting pasted the can? Yes it goes into the turbo, but if this is happening during idle what's the effect going to be? Dirty IC? I just bought a replacement maf, map, and iat. Having just installed the iat, I don't believe this is causing my surging issues. Next will be the map, and last the maf. When I get to the maf, I'm going to cut my injen intake into two, and insert the stock MAF housing as I've seen reports that this intake may cause lean issues. Edit: Swapped MAP and no improvement. Edit 10/26/18: I cut my intake up and reinstalled the stock MAF housing. Not only has this fixed the issue, but the sensor is now facing up for easy access in the future. Last edited by kglewis1; 10-25-2018 at 03:55 PM.